Lauryn Hill: Interview Hear an interview with the singer and rapper whose voice is the story of the hip-hop generation. 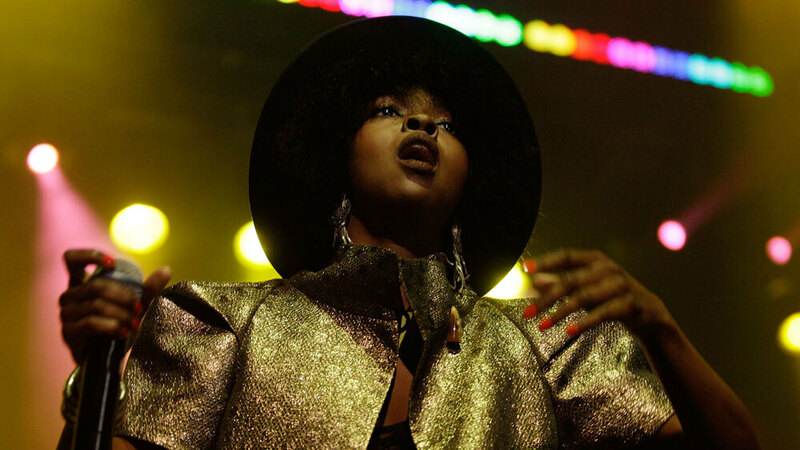 Lauryn Hill performs in January in Sydney, Australia. Hill became a star with the hip-hop trio The Fugees. Their second album, The Score, came out in 1996, and it was an instant classic. The group — Hill, Wyclef Jean and Prakazrel Michel — sounded like they were in perfect sync. On the first single, "Fu-gee-la," Hill sang the hook, rhymed a verse, then sang again. She was the total package, more so than any other rapper, male or female, has been. She's one of slickest rappers ever: Her rhymes are dexterous, spiritual, hilarious, surprising. Without a doubt, she was the best-looking rapper the world had ever seen. And Hill was a soul singer with a real old-school, almost militant, politic. The second single was Hill's cover of Roberta Flack's "Killing Me Softly." That recording has never really gone away, and its success built the expectations for Hill's solo record to a fever pitch. Particularly to women and young girls who listened to her then, she was a revelation. There was steel in her voice when she rapped; she sang like she really cared about our hopeless crushes and our impotent rages, like she really loved us. We thought maybe we could grow up to be like her. The Miseducation of Lauryn Hill came out in 1998. It was like LeBron James' rookie year in the NBA. You knew he had the potential to be great after seeing him in high school — and then, right out of the gate, he's one of the best ball players in the league. Jayson Jackson, part of Hill's management team, described the recording process this way: "The record was already inside her. She would go into the studio, and it would just pour out of her." Lenesha Randolph sang backing vocals on Miseducation, and she describes herself today as the backing vocals "to all your favorite artists." She's on tour with Lady Gaga right now, but a formative influence on her singing was her work in the studio singing backup for Hill. "I don't know if people are gonna like this album, because I'm just singing, and nobody wants to hear rappers sing," Hill told Randolph at the time. Randolph says she couldn't believe it. "I was like, 'What are you talking about?' " Randolph says. "I would just stare at her, like, look in her mouth! Because when you hear her sing, and then hear her speak — it had such power and volume and rasp. It was something to strive for." The feeling that you get [when you hear me sing], I get first. In 1998, everyone was listening to her sing: mothers, daughters, college students and little kids. As the rapper Nas described his audience, "listeners, bluntheads, fine ladies and prisoners." Miseducation crossed demographics and genres. It made people dance and cry and blast it from their speakers as they drove around with their best friends. Jay Smooth, a longtime radio DJ, remembers there was a little sadness in the hip-hop community that there was less rhyming on the album than during Hill's time with The Fugees. "We may have missed out on the best rap album of all time," he says. Nevertheless, the album was a note that longtime fans of hip-hop had been craving for someone to hit. Smooth says that for people his age — the same age as Hill, the same age as people like Tupac Shakur and Biggie Smalls — "we saw our generation create something so powerful and innovative. They were speaking with a love and righteousness that we, perhaps naively, believed could change the world at that time." Smooth compares the idealism of the hip-hop generation to the hippies before it. But just as the optimism of the '60s gave way to what he describes as "the malaise of the '70s," Smooth says that hip-hop had lost its way. The music grew more commercialized, and consequently more violent and self-involved, culminating in the deaths of Tupac in 1996, and then Biggie Smalls in 1997. "It was right after that, in 1998, that Lauryn Hill's album came out," Smooth says. "And it seemed that she was that voice inside our soul — coming out and asking all of us, 'How could we have gone so wrong?' and 'Can we have some grown folks talking about loving ourselves, before it's too late? If it's not already too late?' "
Hill raked in the Grammys, including Album of the Year. But that same year, some of her collaborators filed suit, saying they weren't properly credited on the album. They settled out of court, and the stir over the suit prompted what seemed like a fall from grace for Lauryn Hill. Shortly after the Grammys, in the winter of 1999, Hill disappeared from public life. For years afterward, her fans traded rumors — the prevailing theory was that she'd had some kind of breakdown. Smooth says he thinks the pressure put on her to save the hip-hop generation from itself might have broken her. She was also a busy mother: Over the past 10 years, she's had five children. Her MTV Unplugged album, which came out in 2002, seemed to reveal a person worn thin. After Unplugged, those of us who grew up listening to her missed her voice in the same way we missed our hopeful youth. That powerful sound that represented great potential being fulfilled was silent. "No one ever stops missing her," Smooth says. "Every time you say her name — like, 'Lauryn Hill walked into Home Depot' — you'll be hoping she starts tapping on a table and making a beat and singing." This could be the year. Lauryn Hill took the stage at the Harmony Festival in Santa Rosa, Calif., just a few weeks ago. She's barely performed at all in the U.S. in the past 10 years. The band was restless and loud behind her, almost drowning her out at times. She looked completely regal, even in a carnival balloon-style jumpsuit, with her hair blown out and dyed maroon to match. She pranced around the stage in huge heels, shouting directions to the band, as though they were in rehearsal. When she rapped, her words flew by so fast, it seemed she was barely breathing. But when the sound guy brought her mic up and the band would breathe for a moment, her voice soared over the crowd. It was the same voice I'd grown up with, just as raw and present and full of soul as I remembered. The reputation that surrounds Hill is wild — it's hard to know what to believe, because she does so few interviews. She's got handlers on top of handlers, publicists and managers who, you think, will lead you to her, and then they turn out to be red herrings. My editor and I chased them all down during the weekend of the Harmony Festival. I was told by various people to not touch her, don't look her in the eye; that instead of talking directly to you, she writes on a Post-It note and sticks it to your chest. I've also been told repeatedly not to call her "Lauryn" anything — she goes by Ms. Hill. This is the only rumor that turns out to be true, in my case. Because after her performance in Santa Rosa, when we ask Ms. Hill if we can ride with her back to the hotel and ask her some questions, she tells us to get in the car. I ask her the question her fans have been asking each other for years: Why did you stop putting out music? "There were a number of different reasons," she says. "But partly, the support system that I needed was not necessarily in place. There were things about myself, personal-growth things, that I had to go through in order to feel like it was worth it. In fact, as musicians and artists, it's important we have an environment — and I guess when I say environment, I really mean the [music] industry, that really nurtures these gifts. Oftentimes, the machine can overlook the need to take care of the people who produce the sounds that have a lot to do with the health and well-being of society, or at least some aspect of society. And it's important that people be given the time that they need to go through, to grow, so that the consciousness level of the general public is properly affected. Oftentimes, I think people are forced to make decisions prematurely. And then that sound radiates." This would sound self-important coming from many other artists, especially popular artists. But to someone who grew up with Hill, it makes sense. She did have a hand in shaping how we were feeling, or it seemed that she did. And the disappointment of her disappearance is just one in a catalog of disappointments that we experienced as we grew up. Her voice sounds just the same: low and raspy, full of intensity and soul. It's no wonder. She tells me she grew up singing along with mostly male soul singers — "the Donny Hathaways, the Stevie Wonders, the Jackie Wilsons." As for her rhyming skills, she says she used to have a rapping voice and a singing voice. But now the voices have to become one, in order for her to get the kind of music mix that she wants in a live performance. It's a work in progress. It's so funny to hear that Hill is still working on her extraordinary voice — holding it out in front of her, waving it like a sheet to see what more she can shake out of it. "I'm trying to open up my range and really sing more," she says. "With The Fugees initially, and even with Miseducation, it was very hip-hop — always a singing over beats. I don't think people have really heard me sing out. So if I do record again, perhaps it will have an expanded context. Where people can hear a bit more." How You Gonna Win When You Ain't Right Within? I ask her what it feels like to sing, and she flips the question on me — "Well, what's it like to hear me?" I tell her listening to her sing makes me feel both happy and sad. It feels like her voice comes from a higher place. I'm paraphrasing all the people I've interviewed about her. "The feeling that you get," she says, "I get first. I think you have a delayed experience with the feeling that I usually get. When I have a creative insight, there is a high. I think back in the day, I made music as much as I did because it made me feel so good. I think you could argue that there is a creative addiction — but, you know, the healthy kind." I ask her about having a voice that moves so many people, if there isn't a certain amount of responsibility that comes along with that. "I think about it, and yet I don't think about it," she says. We pull into the hotel parking lot and she's about to continue, but we're interrupted by one of the festival employees, who comes up to the car to ask if someone-or-other's keys are in the Suburban we're riding in. "No," Hill says with a laugh. "No one in here has those keys." After all, it's just Hill, me, the driver and my editor in the car. As the man walks away, Hill says, "He looks just like Matthew McConaughey. First, second cousin. He does! ... What I was I saying? Oh, I think if I was created with such power or an ability, then what's also been put in me is the blueprint for the responsibility part, as well. I have to take care of myself in order to take care of this gift, which has affected so many. I don't treat it lightly. It's important to me to be healthy and to be whole." And Hill seems healthy and whole, squished up next to me in the car, making cracks about ridiculous-looking actors, chin in her hand as she thinks through the answers to my questions. She doesn't tell me to move back, or that she doesn't want to answer something. Watching her perform earlier in the day made me uneasy. I felt like I was watching a captain who had spent a life at sea, then lived on land for 10 years, stumbling a bit her first time back on the deck of a boat. But hearing her steadiness now, I feel hopeful. It's also a reality check: Why did we demand so much of this woman? "I don't know if you know this, but I have five children," she says. "The youngest is 2 now, so she's old enough that I can leave her for a period of time and know she's going to be OK. That's one reason [Hill is starting to perform again]. And I think it's just time. I'm starting to get excited again. Believe it or not, I think what people are attracted to about me, if anything, is my passion. People got exposed to my passion through music and song first. I think people might realize, you know, 'We love the way she sounds, we love the music, but I think we just love how fearless she is. How boundless she is, when it comes to what she wants to do.' And I think that can be infectious." This closes the interview. I thank her. She says, "You're welcome," and my editor and I leave the car. We sit on the stairs for a few minutes to catch our breath. We spent all weekend chasing Lauryn Hill, hoping to have this conversation about her voice. I compared it to a video game with infinite levels you didn't even know existed, like when you beat a level and you think you won, but then you go through a door and there's a whole other world you have to conquer. Getting to Lauryn Hill was like that. Sara Sarasohn, my editor, compared the chase to the Israelites rising up and following the cloud over the Tent of Meeting. In the Torah, when the Israelites are wandering in the desert, there was a cloud over the Tent of Meeting, where the Ark of the Covenant was kept. When the cloud lifted and moved, the Israelites would see it and know that it was time for them to move as well in their journey through the desert. It was like the presence of Hill was this cloud that we could see in the distance, and we were trying to follow it, and finally, we got to the Tent of Meeting. Sitting on the stairs together, Sara and I couldn't help but cry, just a little. We talked to Lauryn Hill. And she's doing fine.